It’s February and LOVE is in the air…..
Here’s my big orange guy, looking incredibly handsome and striking a pose for the camera, yesterday……gets me right in the pumper!!! Here’s my Joe, doing his best desert sheik impersonation while he was cooking up lunch for us, also yesterday. The split pea soup was delish, btw!!! Joe has come a long way from not knowing how to cook such a short time ago. Guess I should say, he had no previous experience cooking!!! Now, many a day/night, I get to recline on the sofa, book or knit needles in hand while my Joe creates a culinary delight. He is also a delight, in so many ways and truly, the nicest person I have EVER known! Yes, the Mitz still LOVES her sweater/vest! And finally, what could be better than a beautiful banana loaf to say……. Yummmm…..and the delish aroma wafting through the air was almost as good as the first bite!!! Here’s the recipe, courtesy of Martha Stewart. Only change I made was reducing the sugar by about 1/2. 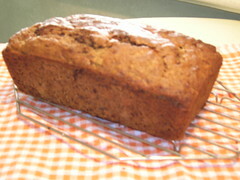 This is a delicious banana loaf, the coconut really adds a nice touch. Have a wonderful week and remember to hug everyone you love. A great way to warm up February. ooooh, I love your new banner. snow, snow, snow!!! and the photos of your kitties are beautiful. The Joe In The Kitchen photo gave me a giggle. life with through all the ups & downs and in-betweens? decreasing the amount of sugar. wow, CANNOT BELIEVE that they’re cuddling and HOW CUTE IS THAT?!?!?!?!!? this is somewhat of a kitty coup that you have scored. Unfortunately I don’t expect to have such peace in my household. very nice blog header too. Oh wow, that first shot is simply breathtaking- So sharp, such intense colors… And so cute, too! 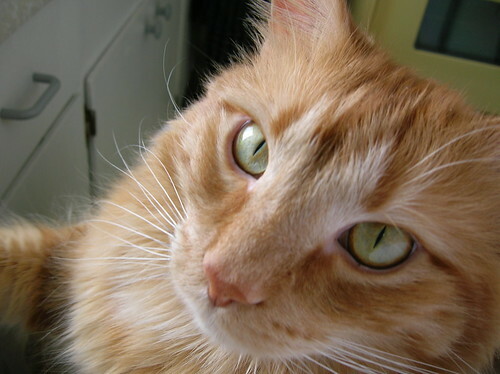 He’s definitely a beauty – Cheddar, that is… *wink* – but I am amazed at the “truce” – really looks like a love nest. It’s like a miracle…I have never mastered the art of making kitties like one another. My two never quite got there, but they did find some sort of middle ground so I guess I had some influence. Veggie Guy loves cooking for his wonderful Ger. Love ya too!!! Wow…what fabulous pics! You and Joe, and the felinines are just great! Nice to see you all! Glad to see that Mitz has extended the paw of friendship to Mr. C and finally agreed to share her space and her people! Our snow has melted, too…..just today in fact! It was 54 F here today, just wonderful, and timely too since my son has moved home from Idaho for a while. 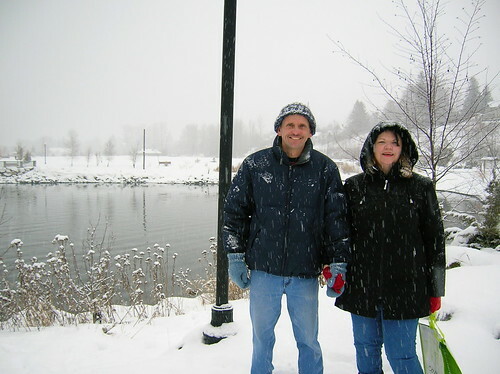 Hi MaryAnne, I love snow too, unfortunately it’s not staying on the ground here for very long. Glad I took these photos when I did and happy you enjoyed all! Hi C, It’s not an ‘all time’ thing but it’s a LOT better than this summer, when Mr. C first came on board. I particularly like the one with Mitz putting her paw around his shoulder, ain’t that a hoot!!!! Hi Hannah, I love that one too, caught just the right moment and the camera was handy. You certainly know how to take a great pic, judging by your food photos!!! 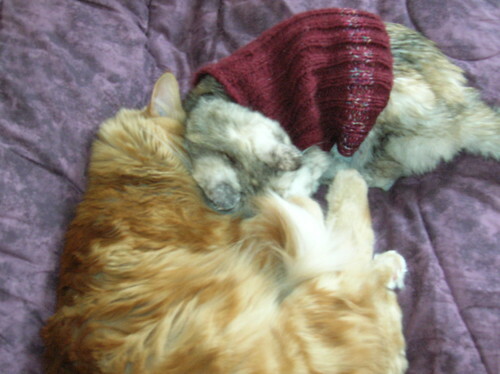 Hi Sheep, This was the first time that I actually had problems with kitties getting along, in the past it was a week of snarling and then everybody was pals. But Mitz is more ahhhhhem….set in her ways now, so its taking longer. Definitely progress though, as I already said. Hi Veggie Guy aka Joe, And ditto to you! That pic of you as the ‘sheik’ just busts me up!!! Hi Michelle, Glad you liked all the pics. Wow, must be nice to have your son close by again. Wow, those are snuggly kitties! But it’s cold. Not the reason? lol. Joe looks like he’s practically smacking his head on the kitchen ceiling! Dedication to cook for you after that. 🙂 Go, Veggie Guy! And wow, your afghan is really beautiful. So precious… They warm your heart. I have many pictures of my kitties.. They are always doing such cute, warming, or funny things.. I have the mom and two of her babies. Well, I call them babies but her children are about 2 1/2 and she is approximated at about three. Animals bring you a special love…. It is snowing here today but not too much.. Have to be careful after it rains because then the ice and slush comes..
that first kitty photo looked like my cat Angus ; lovely coat and sweet personality!! Nice blog, I will be back! Split pea soup is one of my faves. Mind you I love nearly all homemade soups! Lucky you. Hi GN, Would love to see a kitty pic or two on your blog sometime, there can never be enough pet photos, or foodie ones either, in Blogland!!! Hi Merri, I enjoyed browsing your blog too and I will be back as well. The banana bread is delightful!!! Hi Diane, Also loved visiting your blog, I often see your comments over at Caroline’s (love your avatar photo that’s how I remember!!) This is a recipe from my cookbook, do check out my recipe archives for lots of great homemade soups. Aww, look at those two!